Headaches are one of the most common complaints today and there are several different types of headaches of which the migraine form of headache is very common. Migraine is a common type of neurological disorder that is characterized by severe headache, mostly affecting only one side of the head, which tends to affect the normal functioning of the individual to a great extent and is capable of bringing life and work to a standstill. Migraines tend to be partial towards women; Women are three times more susceptible to migraines compared to men. The direct cause of migraine is still unknown, however, the widely accepted causes are those related to constriction of the blood vessels as well as the biochemical changes that occur at the time a person experiences headache. Some of the possible triggers of migraine include stress, anxiety as well as hormonal changes. Women may suffer from migraine during or around the time they menstruate, during pregnancy as well as around their menopause. Migraines are believed to be hereditary and the gene is transmitted from one generation to the next. Unilateral pain sensation – pain usually felt on one side of the head, but may progressively spread to the other side as well. The different types of migraines have their own set of specific symptoms with the help of which they are identified for effective treatment. Migraine attacks usually are divided into four phases, but it is not necessary that everyone experiences all five stages in succession as it varies from person to person. These four phases are Prodrome, Aura, Headache and Postdrome. Prodrome: This stage refers to the set warning signs that appear before the actual attack strikes. The changes may be physical or mental, like those related to mood and irritability or fatigue and tension. Not all people go through this phase and those who experience this usually are able to perceive the changes a few hours before the pain sets in and serves as an effective warning before the pain strikes. Aura: A small percentage of people experience visual disturbances or altered perception during the pain phase or before its onset. Auras need not necessarily be visual, but visual auras are the most common. Auras are usually associated with the constriction of vessels that supply blood to the brain and when the constriction relaxes, the intensity of the aura dies down. Headache: Migraine pain is usually unilateral, that is, it affects only one side of the head, around the eye or the temple. However, in some cases both sides may be affected. The pain is usually throbbing or pulsating, triggered by neurochemical responses that involve the brain stem. Some persons also complain of nausea and vomiting in addition to the throbbing pain. The pain may last for a few hours to a few days and the duration and intensity vary from one person to another. Postdrome: This is the phase that a person experiences after the pain goes away, something similar to a hangover that may last for a few hours and sometimes extend to a few days. This phase is usually characterized by cognitive difficulties, dizziness, mood swings and a mild but persistent headache. The International Headache Society has come up with a comprehensive classification of the various types of headache as well as a separate classification system for Migraine headaches. Migraines are vascular headaches, that is, they are closely associated with, and are caused mainly due to the changes that affect the size and form of the arteries that surround the brain in the skull. For any headache to qualify as Migraine, the pain has to be of moderate to severe intensity, pulsating or throbbing and primararily affecting one side of the head. Broadly, Migraines are classified as those that are accompanied by auras and those that are not. Migraine With Aura : Auras are nothing but visual disturbances that a person experiences prior to or during the migraine attack. The duration of the aura may vary from a few minutes to a few hours. Auras are not necessarily visual; they also include altered sensory and cognitive perception. This type of migraine is relatively more common among men than women. Migraine Without Aura : This is the most common type of Migraine where the person experiences mild to severe throbbing pain in the forehead. In this type of migraine, all the symptoms of the previous type of migraine are noticed, the only change being that these migraines are not accompanied with visual or sensory auras. The frequency and intensity of the bouts vary from person to person. In most cases, physical exertion and exercise aggravates the pain. Some of the less common types of Migraine are as follows. Hemiplegic Migraine: This type of Migraine presents itself during childhood and usually ceases once the individual reaches adulthood. This again is further classified into two types; Familial Hemiplegic Migraine and Sporadic Hemiplegic Migraine. It is difficult to diagnose this type of migraine as the symptoms are usually confused with symptoms related to conditions such as epilepsy and stroke. This type of migraine is distinguished by extended aura that stretches for days together. Opthalmoplegic Migraine: Also called Occular Migraine, this type of migraine is caused when the muscles that help in the movement of the eyes weaken and blood vessels supplying to the eye become constricted. Visual disturbances and double vision are common symptoms of this type. Basilar Artery Migraine: This type of migraine is also associated with aura. This is mainly caused due to the arterial disturbance at the brain stem region. Double vision, slurred speech and lack of coordination are some of the most common symptoms. Status Migrainosus: This is a rather rare and an extremely severe type in which the pain lasts for days together. The intensity of the pain and the associated symptoms are so high that in some cases people may require to be hospitalized. Migraine Aura Without a Headache: Here, only the aural symptoms are experienced in the absence of any pain. 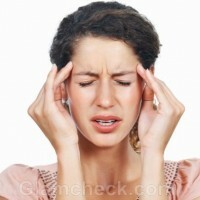 The associated symptoms of migraine may present itself but without any headache. The best time to treat migraine is definitely the earlier stages and for this, early and correct diagnosis is of the essence. Migraines are usually misdiagnosed. It is important to identify the specific symptoms that pin the headache experienced by an individual to migraines to prevent the ill effects of a misdiagnosis, that is, eventually the pain remains untreated. There are no miracle cures for migraines, but it is definitely possible to control the severity and frequency of the attacks. When a person experiences symptoms characteristic of migraine it is best to treat them right away to reduce the severity of the pain. Preventive medications, alterations to one’s lifestyle and avoidance of the common triggers of migraine may help to reduce the frequency as well as the intensity of the attack. Several over the counter analgesics are effective in treating the symptoms of migraine. Migraine headaches are not life threatening, but since they tend to last for extended periods of time and are capable of recurring it is best to take care of the symptoms at the earliest.